One million of the calls for help to Samaritans are from people thinking about ending their lives, they cannot see a way forward. These are normal people who are struggling to cope with what life has thrown at them from divorce and bereavement to redundancy, and are the types of people we help as lawyers on a daily basis. You never know when you might need Samaritans; or your colleagues, or your family, or your friends. But you do know they will always be there, 24 hours a day, seven days a week. 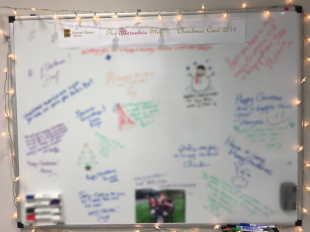 So while we all saved ourselves the cost and time of buying and writing 30 Christmas cards – we’re possibly also helping save someone’s life. Everyone here is really pleased therefore to be sending a cheque to the Bury St Edmunds and West Suffolk Samaritans for £140.44: £70.22 donated by staff and then doubled by us. If something’s troubling you, you call call them on 01284 750000 (local call charges apply) or their national telephone number: 116 123 (this number is free to call).